On October 15, 2008, I went to Liège in order to attend the premiere of the movie Vinyan. It took place at the Sauvenière, a nice midtown cinema, and I was accompanied by Charlène, my lovely girlfriend. Vinyan is the second full-length picture of the Belgian director Fabrice Du Welz, who acquired a good reputation thanks to Calvaire, a horror movie set in the Ardennes. Vinyan tells the story of a couple, Jeanne and Paul, who have lost their son during the tsunami which took place in Thailand in 2004. But one day, Jeanne watches a video coming from a remote area in Burma and recognizes her son, alive. Her husband Paul does not share her enthusiasm (the video is blurred and we only see the back of the boy), but they decide to undertake a journey in the depths of the Burma jungle. One thing for sure, the things hidden in this kingdom are amongst the most surprising and unusual ones. Emmanuelle Béart plays the part of Jeanne and Rufus Sewell (Dark City, The Illusionist) is Paul. The film was shot in English (otherwise I would not dare to speak about it here!) with bits of local language. I must say that this movie is quite unusual and is more concerned to offer a sensory experience than a well-constructed, fully understandable storyline. In that regard, Vinyan is really experimental. The most striking thing is the sound, which sometimes rises to the limits of what the audience can endure. I found that destabilizing but at the same time it implicates the spectator in the movie. This is really a film to live and not only to watch, provided that we can get involved in the story. The use of the camera and the grainy photography are also destabilizing, but some shots are simply unforgettable, like the boat trip in front of the Burma coast or a nice gory scene at the end. I didn’t take a tremendous pleasure in watching Vinyan, but I quite liked it and this is for sure something that we are not used to see. I would gladly see it again. The director Fabrice Du Welz was present as it was a premiere. He answered to some questions after the screening, concerning for example the shooting on location or his intentions in making such a movie. He seems to be quite a nice guy and was kind enough to sign my entrance ticket, which made me happy! Now I’m looking forward to watching Calvaire, of which I had heard about long before Vinyan, without being able to see it. As I am addicted to horror movies, this one naturally titillates my curiosity! On November 17, 2008, I went to the Adam Smith in order to attend a lecture by Jared Diamond, of whom I had never heard about before! I discovered a really interesting, captivating as well as funny lecturer (we learnt everything about his wife’s birthday!). 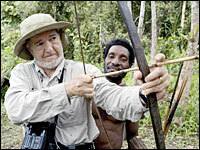 Jared Diamond comes from physiology and biology and has written many books, including one which won the Pulitzer Prize. The main theme of his lecture, called “Coping with change”, was the evolution of societies facing important crisis, how they manage or fail to adapt themselves to change. He started by giving some examples of ancient societies which collapsed (i.e. the Vikings or the inhabitants of Easter Island) and some reasons of why societies could collapse (i.e. environmental problems, climate change, human destruction of their natural resources, as well as religious, political, economic and cultural reasons). Then he stressed the importance of learning from the past. We must take any possible problem seriously and try to solve it early. But the errors of the past are not always taken into account. Hence Diamond’s parallel between the Maya civilization and the attacks of September 11, 2001. Both cases can be seen as the elite of the world isolating itself from the problems of the rest of the world, leading to unhappy people attacking them (the Maya’s kings were killed by their own unhappy people). Lastly, Jared Diamond pointed out the main differences between the past and the present. A first negative difference is the never-ending increase of technology and population (i.e. it could lead to a very quick deforestation of the planet). A second negative difference is globalization, because for the first time in history, a global collapse is possible. A positive difference is the existence of the media, which allow us to be in virtual contact with other countries, to see how they manage or fail to solve their problems, to learn from the past, etc. Professor Diamond hopes that mankind will take advantage of this situation. To conclude, I would like to say that I found this lecture really interesting. Everything was clear, easy to understand and always illustrated with examples. I did not notice the time go by. What could BA2 and BA3 students do on a Saturday afternoon? Well, as we were all dying to stay at our favorite faculty, the answer was simple: We attended the BAAHE conference on November 22, 2008. As there were always three lectures at the same time, we were free to choose which ones interest us the most. As far as I am concerned, I wanted to broaden my horizons, so I travelled from one section to another (the sections being literature, linguistics and ELT). I listened to Frederik Van Dam’s “Character and the career: Anthony Trollope’s Phineas Finn and the rhetoric of the Victorian state” (winner of the BAAHE 2008 Thesis Award), Lieselotte Brems’ “The grammaticalization of size noun expressions: A diachronic corpus study”, Katrien Deroey’s “Corpus-informed EAP syllabus design: A study of lecture functions”, Peter Flynn’s “Translators’ narratives and their contribution to a deeper understanding of translation practice” and Michael Boyden’s “Translation and linguistic justice”. Though the topic appealed to me, I must admit that I didn’t go to Mr. Delabastita’s lecture but left the faculty furtively in order to catch my train. I know it’s bad! The most interesting lecture to me was the plenary lecture by Barbara Dancygier. She spoke about material objects in dramatic or poetic discourse and showed how they participated actively in such discourse. Indeed, material objects have the power to create certain kinds of expectation, the power of evocation, they are doing something and are sometimes spoken to by characters. I also enjoyed the lunch, which was tasty. Mr. Vandelanotte deserves to be congratulated for having organized such a day. It must have involved quite a huge amount of work and preparation but the end justifies the means. Everything took place without any problem or accident (at least from my perspective).